Comment: Islamawareness absolutely does not consider niqab to be an obligation, however realises it is a matter of faith and sisters wish to wear it to emulate the Mothers of the Believers (there are many other ways to emulate them too ofcourse). Therefore I strongly condemn the odious Niqab ban thats comes into force in France tommorrow. This is just another way for the Islamophobic French government to marginalise and oppress its Muslim citizens. There is no Egality, Fraternity or Liberty in France, in fact when it comes to Muslims there never really was. Kenza Drider, a respectable mother-of-four, will leave her home in Avignon's Place de la Résistance on Monday with the intention of committing a crime. If the police are waiting for her – and they have had more than enough warning – she will be cautioned, perhaps be asked to accompany officers to the local station, possibly face a fine and, perhaps, will leave with a criminal record. It is unlikely she will end up in jail, but who knows? It is a risk she is willing to take. Drider is not only determined to become a miscreant; she sees it as her absolute duty to do so. This 32-year-old French housewife has become the face of the country's "burqa brigade", the women in France who cover themselves from head to toe in full veils. She will fall foul of a law that comes into effect on Monday 11 April tomorrow and forbids French citizens from covering their faces in public places; despite the ban's deliberately general wording, there is no doubt that its target is very specific: Muslim women. Drider's first offence will be to set foot inside Avignon's TGV rail station where she is due to take a train to Paris. For this she risks a €150 fine and, if she repeats the offence, being sent on a "citizenship course". "I will be going about my business in my full veil as I have for the last 12 years and nothing and nobody is going to stop me," she declares, swathed in the material she refuses to take off even while speaking to a female journalist in her own home. Like most of the women concerned by this law, Drider wears a niqab veil that reveals only her eyes, as opposed to a burqa, the full body covering worn by Afghan women. 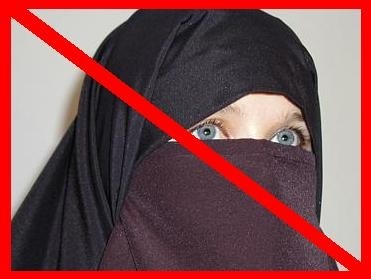 For all the political energy President Nicolas Sarkozy's right-of-centre government has expended on this law, it will affect a relative tiny number of women; estimates range from 350 to a maximum 2,000 full-veil wearers out of France's population of roughly 64 million. One group of women it is unlikely to disturb unduly are the wives of visiting oil sheikhs and rich Arab businessmen: only if a luxury shop insists they remove their veils might they be challenged. It is not the potential effectiveness – or otherwise – of the ban that bothers Drider, however. It is the principle. "This whole law makes France look ridiculous," she says. "I never thought I'd see the day when France, my France, the country I was born in and I love, the country of liberté, égalité, fraternité, would do something that so obviously violates people's freedom. "I'll be getting on with my life and if they want to send me to prison for wearing the niqab then so be it. One thing's for sure: I'm not taking it off." A succession of journalists have traipsed through the Drider family's modest home since the law was mooted a couple of years ago. Reporters from the BBC, CNN, CBS, Time, the Sun, Reuters, Agence France-Presse, as well as journalists from Brazil, Spain, Turkey, Indonesia and Japan, have all sat here on the sofas that line the walls of the neat but simple living room. The Observer has been given a slot following Friday prayers, after a journalist from a local Marseille newspaper and before a television team from Al-Jazeera. Drider admits she is "very tired", but is nothing less than polite and charming, even when she is answering questions that she has been asked a dozen times before. The publicity drive, it seems, is a question of duty. The St Jean estate, not far from Avignon's medieval ramparts and the celebrated bridge, is not so much impoverished as uniform and unimaginative, a maze of apartment blocks painted various shades of beige. Washing hangs from open windows and satellite TV dishes sprout from buff-coloured balconies like urban fungi, but the children's playground nearby is free of litter and graffiti. There are no children playing truant; in fact, there are so few people it is like a ghost town. Locals, many of them from France's immigrant communities, do not draw attention to themselves. A woman in a headscarf shrugs, apologises and hurries off when I ask her about the burqa law. Drider's husband Allal, 40, who works in a soup factory ("but only in winter when people eat soup") says that, unlike other urban housing estates, the area is not "chaud" (hot) and there is little trouble. Allal is jolly and smiling with a neatly trimmed beard. He jokes that perhaps he should grow it longer and bushier, as Islamophobes think he and his wife are extremists. Parliamentarians and feminists in France have argued that the full veil is a symbol of male oppression and that niqab-wearing women are bullied into it by their husbands. In Drider's case, this seems unlikely. In fact, Allal describes his shock when, without any warning, his wife emerged from the bedroom to go shopping one day wearing her niqab. "Are you really going out dressed like that?" he asked. "I didn't even know she had bought one," he tells me. Drider, whose parents were immigrants from Morocco, says wearing the niqab was her own personal choice. In this, according to a study by the At Home in Europe project of the Open Society Foundations, she is not unusual: nearly all of the 32 French women interviewed for the project say that they – and no one else – made the decision that they would wear the niqab. "There was no mosque involved, no pressure from anyone. It is not a religious constraint since it is not laid down in Islam or the Qur'an that I have to wear a full veil. It is my personal choice," she says. "I would never encourage others to do it just because I do. That is their choice. My daughters can do what they like. As I tell them, this is my choice, not theirs." She adds: "I never covered my head when I was young. I came from a family of practising Muslims, but we were not expected to even wear a headscarf. "Then I began looking into Islam and what it meant to be a Muslim and decided to wear a headscarf. Afterwards in my research into the wives of the Prophet I saw they wore the full veil and I liked this idea and decided to wear it. Before, I had felt something was missing. Then I put it on and I felt serene and complete. It pleased me and it has become a part of me." Drider says it is only since Sarkozy's government began discussing the veil ban that she has been subject to insults, harassment and death threats. "When President Sarkozy said: 'The burqa is not welcome in France', the president, my president, opened the door for racism, aggression and attacks on Islam. This is an attempt to stigmatise Islam and it has created enormous racism and Islamophobia that wasn't there before." Drider says the issue is bigger than her, bigger than a "piece of material", and laughs at the threat of "citizenship courses" and fines, which she says she will not pay. "This is about basic fundamental human rights and freedoms. I will go out in my full veil and I will fight. I'm prepared to go all the way to the European court of human rights and I will fight for my liberty. "Fines? They don't bother me. What is the state going to do, send a policeman outside my front door to give me a ticket every time I go out? For me this is women's liberty, the liberty to wear what I wish and not be punished for it. "If women want to walk around half-naked I don't object to them doing so. If they want to wear tight jeans where you can see their underwear or walk around with their breasts hanging out, I don't give a damn. But if they are allowed to do that, why should I not be allowed to cover up?"